I’m linking up to ohamanda for Top Ten (Tuesday)! What is your Top Ten today? Have you ever heard of Shrove Tuesday, also known as Pancake Tuesday? It is the Tuesday before Lent begins (on Ash Wednesday). Here are 10 things to learn about the tradition of Shrove Tuesday. 1. Shrove is the past tense of shrive which means ‘to go to or make a confession’. Historically, Christians would go to confession to prepare themselves for the season of Lent. 2. 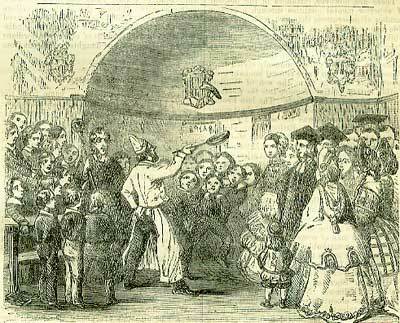 Shrove Tuesday began in the Middle Ages. It was noted in history dating back to 1000 AD. 3. In many countries, especially the United Kingdom, Shrove Tuesday is known as Pancake Tuesday. It became known as Pancake Tuesday because people had to use up all the food that was ‘forbidden’ during Lent which included eggs and dairy products. Pancakes became the popular choice to use up all these ingredients. 4. The Pancake Day tradition tells the story of a housewife getting ready for Shrove Tuesday. She was cooking up all her pancakes and lost track of time when she heard the ‘shriving bell’ ringing, calling her to church. She raced to church in her apron with her frying pan still in her hand. 5. Pancake Races are held all over the world on Shrove Tuesday especially in England. Women dress up in their aprons with their frying pans and a pancake and race through the town to church when the bell rings, all the while flipping their pancakes. 6. The most famous Pancake Day Race is held in Olney, England. This is where the original housewife ran to church with her frying pan in 1445. 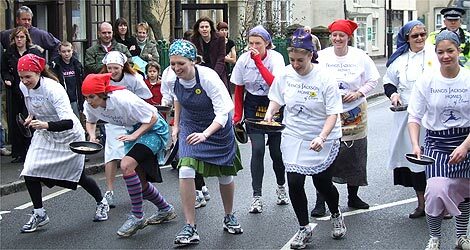 The race happens each year on Shrove Tuesday and begins at 11:55am and participants run 415 yards dressed in the traditional costume of a housewife with a skirt, apron, head covering, and frying pan. Participants must have lived in Olney for at least 3 months. 7. Here are some traditional pancake recipes. 8. Shrove Tuesday has become a day of indulgence and revelry. Although it originally began as a day of confession to prepare yourself for Lent it has become a day of overindulgence and partying … ‘getting it all in’ before you deprive yourself during Lent. 9. Other traditions for Shrove Tuesday are Mardi Gras, Fat Tuesday, Carnival, Malasada Day, and Fasnacht. 10. 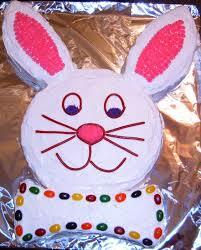 Shrove Tuesday is 47 days before Easter. The Lenten season is 40 days before Easter, however they don’t count Sundays because those are considered ‘mini-resurrection days’ to celebrate Jesus’ resurrection. We’re having pancakes for dinner tonight… anyone else? Wow. My last post was back in March. I’ve thought about posting periodically in these last five months… but then I haven’t because I’ve been overwhelmed by a)thinking I need to have a plan for my posts; b)not feeling witty or interesting; and c)not feeling like I can commit to blogging regularly. I’m just going to jump in and say hello. And leave you with a recent picture. 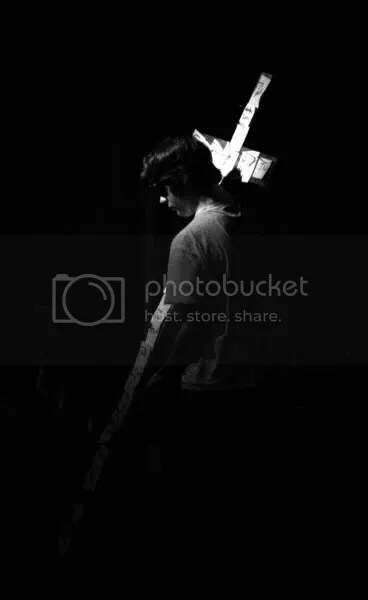 Maybe, I’ll be back soon. This is week 5 of the Losing It challenge. Head over to Giving Up On Perfect to see how everyone is doing! Run: yeah, baby! I have run 4 times since last Friday… a total of 8 miles! I’m gearing up to do a 3mi run some time this weekend. So, this week sticking to my goals has been something that I have been able to do. I’m not sure that I’m seeing the results on the scale… but we’ll see. Earlier this week, I weighed in at WW and lost 1lb. That brings my total weight loss percentage for this challenge to 3.8% (if I did my math correctly). What do you think? Does “nothing taste as good as being skinny feels”? 10. The Miracle Maker – great movie! 9. Cadbury eggs – yum! 8. Palm Sunday Baptisms – our church has a traditions of doing baptisms on Palm Sunday. It is one of the most powerful services we have every year. 7. Easter Baskets – my mom always used to hide our Easter baskets in the house and we would get up and search for them before church. 6. Easter Breakfast – another tradition our church has is a free community breakfast before our combinded Easter service at our local high school (we usually have 3 services every Sunday). It is a great time for our entire church to come together once a year. 5. New Easter Outfit – I always get a new outfit for Easter Sunday… do you? 3. Decorating eggs – its been a few years since I have done this but I know it will be something that I do again once I have kids that are older. 1. 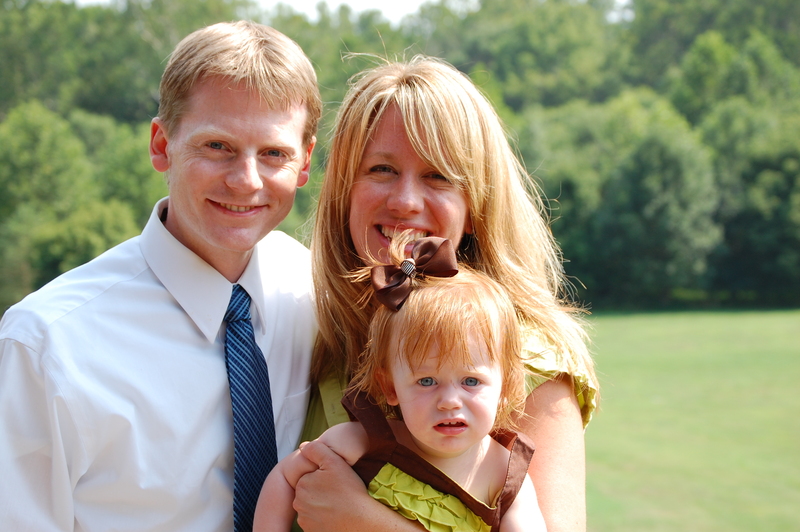 Special Easter Church Events – over the last several years we have participated in special events at our church during Easter. The picture below was taken from something that we did last year called Experiencing Jesus’ Passion – an interactive experience of the Easter story involving art and drama. This year we are planning on attending a combined Good Friday service and then celebrating Easter Sunday with our traditional Easter Breakfast and combined campus Easter Service at the local high school. Want to see some more Top Ten Tuesday lists? Hop over to ohamanda.com and visit the other Top Ten Tuesday links. There are some great posts out there! Okay, so after a few ‘off’ weeks I’m attempting to get back on my regular blogging schedule. This month I have been doing quite a bit of stockpiling and making use of some of the great CAT deals at Shaw’s. (fyi: I’m in the process of writing a few step by step posts about extreme couponing… stay tuned!) We recently purchased a used chest freezer from some friends and I have been able to fill it up will all of the great C.H.I.L.L deals that have been going on this month. This week at Shaw’s there is a sale on Edy’s ice cream: Buy 1 get 2 FREE! Edy’s is also part of the C.H.I.L.L CAT so if you get 10+ cartons you get a $10 coupon off your next order at Shaw’s. Last night I bought 4 cartons, got 8 free and received a $10 CAT. The ice cream works out to be approx. $1.10 per carton. I haven’t been keeping track of my budget this month (on the to do list!) but with all the stockpiling we’ll see how it comes out. I’ll try to update soon! FREE Bottled Water coupon w/purchase of Crystal Light – but you don’t have to get the Crystal Light to use the coupon! Find the coupon tear pad in the bottled water aisle. This is week 4 of the Losing It challenge. 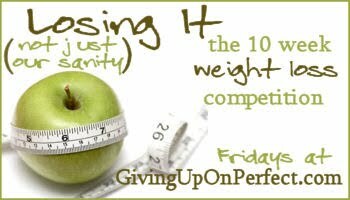 Head over to Giving Up On Perfect to see how everyone is doing! This has been an off week for me. Earlier this week I weighed in at WW and only lost .4 lb. Yeah, I didn’t even bother doing the math to see what percentage that was. I flaked out last weekend on my ‘no carb’ deal… i just couldn’t stick with it. Blah. And then we went to the Great Buffet 2 – yup… Chinese food plus some… what was I thinking? I have no idea how close I will get to my goal before vacation… but I’ve got to keep trying. Oh well… today is a new day. And it is a GORGEOUS one here in New England! Although this week has been super hectic (GSS Board Mtg, MOPS set up, MOPS meeting, work, prepping for Family Night at church tonight), I have managed to be semi-reasonable and I am still hoping for another loss. And once things wrap up tonight, I am looking forward to relaxing this weekend and I am even going to try to go for a run. Woot! Woot! This is week 3 of the Losing It challenge. Head over to Giving Up On Perfect to see how everyone is doing! This week I lost 1.1% of my total body weight (1.6lbs). Not bad but I need to kick it up a notch if I want to reach my goal weight before vacation. I have 10 pounds to go! I weigh in at WW earlier in the week so I have already begun looking ahead toward my next weigh in. This week I decided that I was going to mix things up and try my South Beach/WW combo diet that has been successful for me in the past when I have wanted to kick it up a notch. So this week I have been eating eggs (local duck eggs from What Did She Do Today -thank you, again!) for breakfast, cheese sticks, and lots of salads with chicken or tuna on them. I am hopeful that this will prove to be a banner weigh in next week! In other news, the whole family has been sick so that has made it hard to exercise. I’m hoping that once we get over these colds that the husband and I can spend some quality time at the gym together.